The vanity sinks are made from a combination of Brocade Home vanities and Funky Furniture bathroom sinks from the Dolls House Emporium. The tub is also from the DHE Funky Furniture sets. The terry cloth stools are from Lundby. The toilet is from Theo Klein. The dress form was a random pick-up from a local hobby store. The art is Charley Harper. All of the other accessories are from Re-Ment, Lil Bratz and MegaHouse. ich freue mich jeden tag, hierherzukommen - mein absoluter lieblings-blog. vielen dank für die wundervollen fotos und deine kreativtät, die du mit uns teilst. vielen dank für deinen wundervollen blog, den ich jeden tag besuche und der mir große freude bereitet. Thanks for such nice compliments. You are very creative too. Very cool -- how long did this take you? Also, can I ask where you store all your miniatures? Do you keep them organized so you can find everything? Hey Call of the Small! Thanks much! This scene took about 10-15 minutes. I store all of my miniatures in an Ikea Varde Island unit with 12 drawers AND several several storage totes. I'm somewhat organized but often go searching for items that I have forgotten that I've sold on ebay or given away. Love this one! 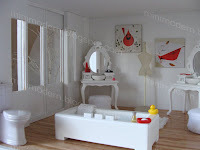 The little loo would be perfect for one of my current projects too - ladies' bathroom at my dollhouse pub/restaurant. Where can I find Theo Klein furniture? I've tried Googling without much success - I'm in the UK BTW. BTW, love your blog - have added it to my blog links. Thanks much! I am not sure where you can find the Theo Klein bathroom set. I purchased the very last one from a shop in Germany (I was disappointed because I wanted 3 sets--I'm sure you are shedding a tear for me. Ha ha!). You may want to contact the company and see if they have records of what shops ordered the Mini World furniture sets. Because you live in the UK, I expect that you should have much more luck than someone in the US. If I see anything, I'll let you know. I just found your blog a few days ago and I read you were thinking about not continuing. Please keep it going, it’s so much fun and your rooms etc. are fantastic. I have gone through your archives with glee. You have inspired me to think about a modern room or even a house. I went on Ebay and bought some Reac chairs, which are so well done. I hope they are as good in person. I found some things by an artisan in Thailand which are great. I bought a table which is a cross between Brocade and T. H. Robsjohn Gibbings and some sling chairs that are amazing and very reasonable. There is a cabinet I wanted too, but I bought my limit for now. I thought maybe someone else might be interested. The listing number is 110343833508. There are some other pieces as well. Thank you for this blog it makes miniatures so fresh for me again. No worries, I'm punishing myself for another year and continuing the blog--ha ha! I appreciate your nice words. The Reac chairs are pretty decent. The cabinet you mentioned is really nice--even with the scroll or scallop design across the top. Thanks for letting us know about this resource from Thailand. Great room as always. I was wondering about the display room. I know we (the 8 of us, LOL) always ask about the great minis, but I think the rooms themselves are great also. I know you have mentioned befor the great houses you have aquired but I get confused as to which house is being used somethimes. Which one is this? Also I have been looking for some room boxes, to keep things simple as I am a beginner and I am having a difficult time finding modern room kits. Any suggestions would be wonderful. I have started putting labels on the posts to indicate which house or structure the room is in. This one is the Malibu Beach. Let's see...for a modern roombox you can sometimes find CD or DVD wall cabinets that look like modern prefabs or ranch-style houses. If they have sliding doors, that helps the effect. Some great ones (though currently discontinued and HTF) are two IKEA cabinets--one called Blista which came in DVD and CD versions (Check Shopping Sherpa blog for CD version--she scored one recently for $5)and another called the Kaxas (it comes in white with orange tinted glass/plexi doors and black with smoked glass/plexi doors). I used to have these but donated them to charity years ago. Sometimes similar cabinets are sold as bathroom wall storage. CB2 has a "storage shelf with doors" that could work. You could probably switch out the frosted glass for plexi panels, etc. Offi has an interesting steel CD and DVD series called Duoplane which always intrigues me. It comes in white, orange and black. Also, I am sure you could probably walk around IKEA and find something that would work well as an inexpensive modern miniature haven. Sometimes a stroll through random stores unearths some cool things. See posts: "The Rabbit Hutch" and "An inexpensive start". I wish I had more knowledge or resources to help but I'm sadly not an expert. Let me know what you find or decide to use. Oboy! I suspect you know already, but Miaim's is up and running. Shipping on the clearview house is a killer though . . . ugh. Yes, I did! ha ha! I can't wait to see what the MIAIM company designs next. I just love your blog.There´s always some inspirations! Tack för dessa vänliga ord. Jag hoppas den här bloggen fortsätter att inspirera dig.